The staff at St Thomas Catholic School is committed to the delivery of quality educational programs. As part of this commitment we envisage that students will view technology as an integral tool for learning. 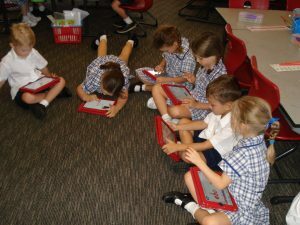 Access to Information, Communication and Learning Technologies is made possible through the provision of networked classroom computers and primary laptop collections. In addition to utilising network capable technologies in their learning, students are challenged to create their own multimedia projects and songs. All staff and students have access to educational materials that have been aggregated and stored within the diocesan on-line Learning Management System.